If installed properly and the mailbox is damaged by Township equipment when snow plowing, we will replace it with a “standard” 4 x 4 wood post and support. Mailbox replacement is the standard box, model 1C. If the post is damaged, it will be repaired temporarily and replaced in the spring or summer. Not all mailbox damage is from the Township equipment. Old, rotted, rusted through posts, or vandalized boxes are not the Township’s responsibility. If the mailbox does not conform to the above guidelines, the Township will not be held responsible. Mailbox structures are a potential hazard and are not condoned by the Township. 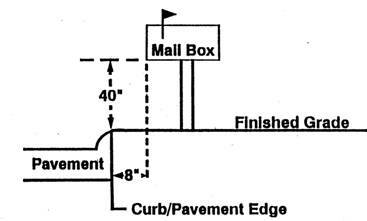 A homeowner wishing to construct a mailbox structure must obtain a permit to do so. In the event a mailbox structure is damaged, repairs/replacement is the sole responsibility of the property owner.